Greensleeves at Camelot is known for hosting medieval themed functions. This venue is situated in a castle on the Camelot Estate in the countryside of Hillcrest. The castle overlooks the Tudor houses, calming lakes and a shaped golf course. Our venue is perfect for hosting medieval feasts, weddings, conferences, product launches, cocktail parties, exhibitions, corporate and functions, and school tours. This venue can be described as an “English Country Paradise”. Greensleeves at Camelot has 3 superb function venues, an attractive chapel for wedding ceremonies and 2 luxurious suites. We have the ability to host a fairy tale wedding at our castle. Relish in a day of romance in the most breath-taking and tranquil environment. Greensleeves at Camelot is one of the top wedding reception venues in Durban. We have an enhancing chapel which is the ideal place to say I do. The chapel can seat 150 people and can be used for the wedding rehearsals. We have an amazing and unique medieval feast with a range of cuisines. Our wedding venue offers a range of wedding reception packages such as the Traditional Formal Anne Boleyn Buffet Style Weddings or the Renaissance Medieval Feast Banquet Style Weddings. We have a team of professional wedding coordinators to handle all aspects of your wedding. We have 2 luxurious honeymoon suites available to all newlyweds. Each room has its own en-suite and includes a continental breakfast. Our venue is the ideal place to have conference and functions. Our conference venue can seat 300 individuals and lunch is served in the castle’s courtyard. Our school tours are filled with fun and excitement. We discuss castles, knights, armour and what it was like growing up in the middle age. 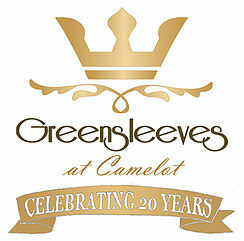 At Greensleeves at Camelot, we invite you to experience the exciting and entertaining splendour in our medieval castle.